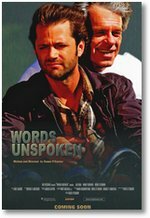 Renee's short film, "Words Unspoken" will be screened at the 2011 Santa Catalina Film Festival, May 6-8. It will be screened with the feature film, "Forgotten Children." You can purchase the DVD from ROC Pictures - click here to order (unfortunately it has no shipping details for Australia or New Zealand).